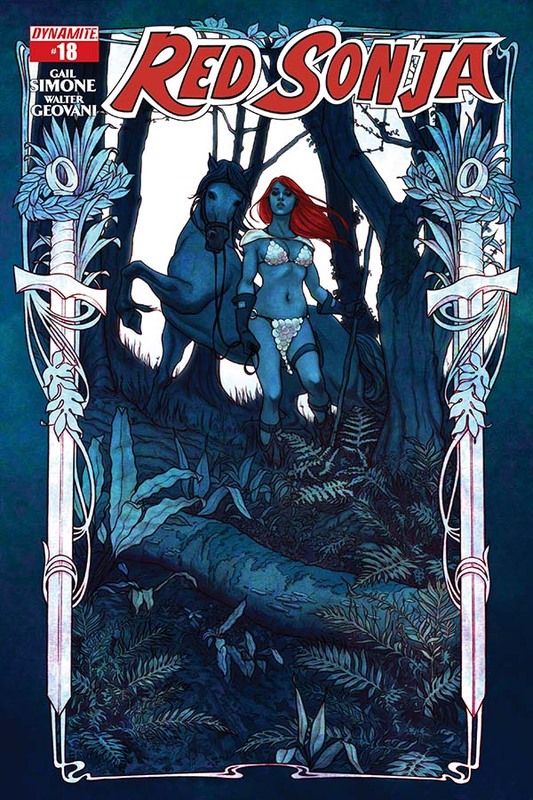 'Red Sonja' #18 marks the end of Gail Simone's excellent run on the series demonstrating what makes the she-devil so special and unique. 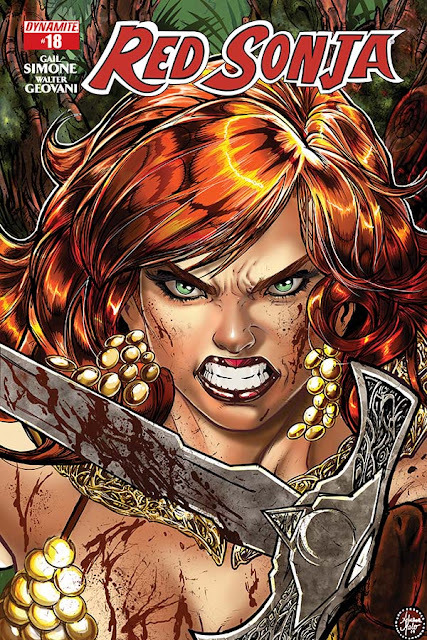 She's a fierce warrior, a witty combatant who wields a blade of steel but has a heart of gold. She continues to defend the library against the Empress Dowager and her band of vicious Vipers. Being in the care of frightened but generous nuns, Sonja has formed an endearing relationship that has opened her world to new tales right out of the library. The issue opens with one of those stories that serves as a nice bit of foreshadowing. The story revolves around a young girl who outwits the terrible bear who ate her parents. Artist Walter Geovani does a fantastic job differentiating this dramatization from the rest of the issue. An interesting choice of exposition arrives at the library's door from the unruly guy from the bar "gloating" about how a team of deadly assassins known as the 'Vipers' are on their way to make Sonja pay. The Empress Dowager is determined to destroy Sonja, the nuns and the vast volumes of tomes within the tower. The stage is set for a final confrontation between Sonja and the Vipers that becomes the toughest fight of her life with everything on the line for the nuns if she fails. Simone has always portrayed her as a conscientious warrior who drinks hard, indulges in her carnal urges and does what is ultimately right. She does so with a sense of humor and a relentless fighting spirit. It's what separates Red Sonja from other strong female comic book characters. And no one writes her better than Simone. Walter Geovani has done incredible work with vivd detail and larger than life splash pages that accentuate the battle scenes with a lot of energy and intensity. His character designs like those of the Vipers are appropriately menacing and arrogant looking. Along with colorist Vinicius Andrade, Geovani has created a dark and lush world with bold accents of color. 'Red Sonja' #18 is a bittersweet swan song for Simone that leaves our favorite she-devil with an optimistic new outlook on life. The exciting conclusion to this arc brings a sense of peace to both the creator and her greatest muse as they part ways.